Thailand’s deep-south is rife with instability. But the cities of Hat Yai & Songhkla City seem a world away from the troubles just down the road. A family enjoying the late afternoon sunshine in Hat Yai park. The Thailand-Malaysia border provinces are traditionally no go zones for Western travellers. Do not travel to the southern provinces of Yala, Pattani, Narathiwat and Songkhla or overland to and from the Malaysian border through these provinces. There are high levels of ongoing violence in these areas, including terrorist attacks and bombings that result in deaths and injuries on an almost daily basis. It further recommends only traveling through the region with the accompaniment of professional security services! While I’m not one to unnecessarily flout the advice of the Australian government, its warning quite deliberately (and understandably - they want to discourage as many people as possible from getting into trouble) is a broad attempt to stop people going anywhere near the real danger zones in Thailand's deep south. But, though it is completely sensible to avoid much of the region, the travel advice ignores the comparable safety of Hat Yai and Songhkla City (still within Songhkla province, but quite some distance from the violence). Though nowhere in Thailand is completely immune from violence, these cities have, in fact, been safer in recent years than other places in the country, such as Bangkok and Phuket, both of which have suffered from terrorist incidents in recent years. 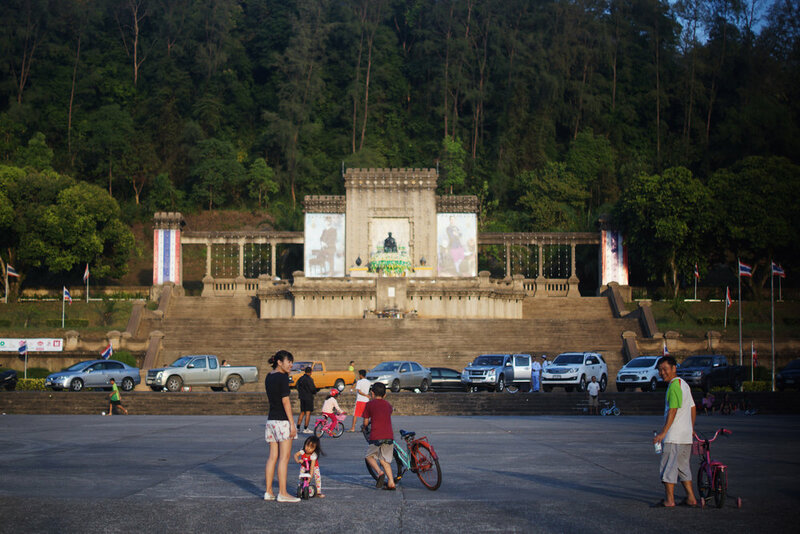 Additionally, Hat Yai is a tourist mecca: it is extraordinarily popular with Malay and Singaporean tourists letting their hair down in a city that still largely speaks their language. I'd asked people before thinking about going there about the security situation. No one raised any concerns at all. So, weighing the options - and determined not to catch a flight - I decided to avoid Narathiwat, Pattani and Yala, but still cross the Malaysian border into Songhkla Province, heading to Hat Yai before continuing north. A wrong turn leads to plentiful views 8 kilometers outside of Songhkla City. When I went to Hat Yai, I noticed that many other travellers in the city - some who even live in Thailand - had no idea the conflict down the road even exists. The provinces of Narathiwat, Yala and Pattani are majority Muslim-Malay areas that have always sat awkwardly within the modern Thai state. Culturally and ethnically connected to Malaysia, those who live in Thailand’s deep-south tend to speak a different language and worship a different God to those further north. The border dates back to 1909 when British, then the colonial rulers of Malaysia, formalised previously unorganised borders with Siam. But this agreement was one negotiated over a desire for territory, and did little to reflect the ethnic and religious makeup, or the desires, of local people in the provinces affected. In the end, Narathiwat, Yala and Pattani would be consolidated into a modern Thai state, but would never quite fit. And while the first signs of unrest in the region date back to the 1960s, things took a turn for the worse in the early 2000s. Though there had long been unrest in these southern provinces, violence really began to break out in 2001 and escalated sharply in 2004, having continued ever since. The reasons are manifest. But experts have argued that mismanagement of the southern provinces by then prime minister Thaksin Shinawatra’s government destabilized a tentative peace. The Thai government’s bloody crackdowns on protests are also believed to have instigated fresh rounds of recriminations, and fundamentally broke any chance of dialogue between southern leaders and Bangkok. The southern insurgency is not just made up of one opposition group. While there is an umbrella agency for southern rebels, Mara Patani, other entities operate in the region, too, making it extremely challenging for authorities to entirely eradicate the threat of violence. To date, the conflict has cost almost 7000 lives, with attacks occurring almost daily in Yala, Narathiwat and Pattani, and occasionally in the southern area of Songhkla province. While those in the south have undoubtedly experienced harsh treatment at the hands of the Thai state in the past, the recent tactics of separatists are nothing short of deplorable. Their enemy being the Thai state, they have targeted anything that represents the government. This doesn’t just include police and military installations, but also schools. November 4, 2006: 3 schools were burned to the ground. February 4, 2007: a bomb was detonated outside a school, killing one. March 14, 2014: a teacher was the victim of a targeted killing. October 12, 2014: 6 schools were again burned to the ground. A giant Buddha in Hat Yai. This city is much more culturally and religiously aligned to the rest of Thailand when compared with the rest of Thailand's deep south. So, is it safe to cross the Malaysia-Thailand border? For Pattani, Yala and Narathiwat, there are genuine, daily dangers but little evidence of purposeful threats aimed towards tourists. But in practice, the main border crossing at Bukit Kayu (on the main road between Penang and Hat Yai) is safe and frequented by tourists from all over the world. This crossing is still technically in the Do Not Travel zone, but has experienced few problems in recent years. It is heavily militarised, and quite a distance from the source of the region's problems. I did meet one person, a Polish cyclist called Maceac, who had cycled through the more troubled provinces. While the dangers are real, he saw no signs of trouble. Maceac also made a succinct point about the unrest: “those people’s problems are with their government, not with foreigners’. It's true: the separatists in southern Thailand have little to gain by deliberately targeting foreigners. Their quest is one that is determined to be seen as legitimate. To attack foreigners would only serve to delegitimise their struggle in the eyes of the world. There have been some concerns that the region is becoming a hotspot for ISIS or Al-Qaeda style extremists, but many experts believe such a threat is a 'Phantom Menace', and that such claims are either just lazy, click-bate journalism or deliberate, Daily Mail-style provocations. And while people from overseas have been inadvertently caught up in their violence - notably in a 2006 attack in Hat Yai - tourists have not been specifically targeted during the nearly two-decade old insurgency. A hidden Buddha in an under-construction temple just outside of central Hat Yai, surrounded by ornate but incomplete murals. Maceac invited me to cycle with him from Hat Yai to Songhkla City, a ride of about 3 hours. He’d just cycled 12,000 kilometers from Warsaw. I hadn’t pedaled a bike beyond city limits for years. But I jumped at the chance and tried my best to keep up. The ride began by passing a plethora of Buddhist temples, which dominate the northern parts of Songhkla province. But in truth, the ride was pretty dull: 30 kilometers along a barren highway between the two cities. But Songhkla city itself was a highlight. Its old town is well preserved, and it has next to no tourists. As we arrived, we were handed waters and cokes by friendly paramilitary who were stationed at the city’s entrance to search incoming cars for weapons and terrorists. My borrowed ride in Songhkla. To cap things off, as we cycled into the city, we stumbled across a vintage bicycle club doing their annual city-wide ride. They invited us to join the peloton, so we rode alongside penny farthings into the center of town and posed for group photos. I spent the rest of my afternoon lounging on beaches and eating street food before racing back to Hat Yai before dark. All in all, the area feels remarkably safe. Yes, it is highly militarised. But the security is necessary and reassuring. It’s a shame that tourism is barely existent in the region outside of Hat Yai. While the separatists grievances may be charged by ideology and cultural dislocation, they are also compounded by economic disenfranchisement that so often drives restless, hopeless youths into the arms of extremists. Were a more secure peace realised - and peace in Southern Thailand made a real priority, not only of Thailand, but of the region - perhaps these restive states could one day stand to benefit from Thailand’s ever-expanding tourism appeal, bringing much need prosperity to a region desperate for a new beginning.